1-3/4 cup Valley Sanitary milk. Scald milk, mix sugar, cocoa and flour together. Add to milk and cook in double boiler until thick. Then add egg yolks and cook 5 minutes longer. Cool and pour into Graham cracker crust. Beat egg yolks and sugar. Add lemon juice and cook in double boiler until thick. Then add gelatin which has been dissolved in the 1/3 cup water. Beat whites of egg until stiff. Add the half cup sugar and fold into the egg yolk mixture. Pour on the dark filling and set in refrigerator until ready to serve. May be topped with whipped cream. 1-1/2 cups Graham cracker crumbs. Mix sugar and cracker crumbs. Then pour melted Snowdrift over. Place in pastry pan and pat in shape. Bake in oven 425 degrees until brown. So where’d it come from? Tricky to say. People tend to point to California. 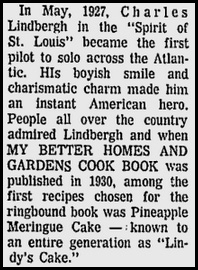 The Los Angeles Times credits the origin to Monroe Boston Strause, saying he devised it in the late 1930s, which would’ve been a neat trick, considering the above recipe was from 1931. Foodtimeline.org cites a 1928 Los Angeles Times article saying that Mabelle Wyman would be teaching how to make the recipe at the Times cooking school as evidence of a Southern California origin. But Mabelle Wyman (who took over the paper’s food column after her husband died in 1926) was from Michigan, and it’s far from clear where she would’ve picked up this technique. Nor is it clear that whatever was going on in California was the recipe we’d recognize. Here’s the thing–in the 1920s, the black bottom was a popular dance (after the Charleston, before the Lindy hop). While the dance dates to the early 1900s and 1910s, it took off with white audiences after being featured in 1920s musicals. Does it seem odd to name a pie after a dance? I guess it is. 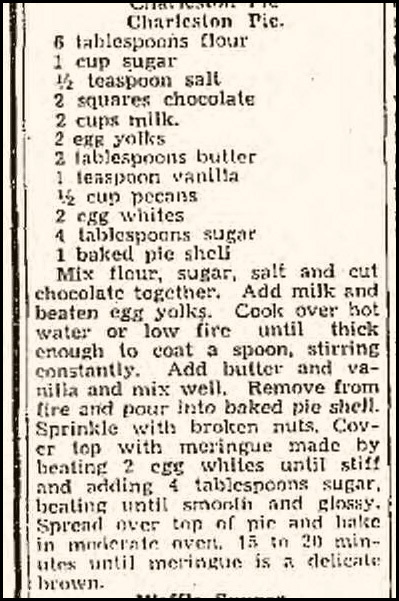 I mean, there are 1928 mentions of Charleston pie, but that doesn’t mean it isn’t weird. Mix flour, sugar, salt and cut chocolate together. Add milk and beaten egg yolks. Cook over hot water or low fire until thick enough to coat a spoon, stirring constantly. Add butter and vanilla and mix well. 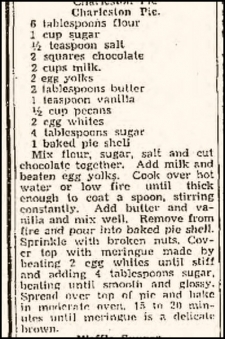 Remove from fire and pour into baked pie shell. Sprinkle with broken nuts. Cover top with meringue made by beating two egg whites until stiff and adding 4 Tablespoons sugar, beating until smooth and glossy. Spread over top of pie and bake in moderate oven, 15 to 20 minutes until meringue is a delicate brown. But I guess that doesn’t prove anything, because there’s no such thing as a Lindy Pie. Look, we didn’t have Netflix then. We had to amuse ourselves by naming desserts after things we liked. And while the black bottom pie literally has a black bottom, so does the Charleston pie. I’m not saying this doesn’t mean it’s from California, I’m just saying that the tendency to name food after things going on around us makes it very likely that multiple recipes were given the same name in different places. The real question I’ve got is this: what kind of ice cream goes into a Harlem shake? From a notebook originally from somewhere in the general area of Sterling, Colorado from the 1930s. 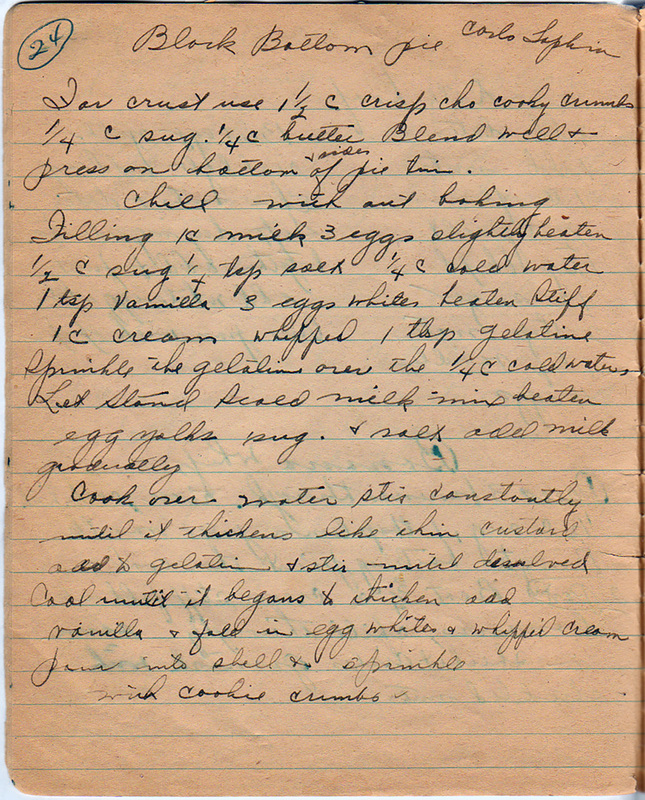 This recipe is from the 20th page of the notebook; here’s the page in full (click to enlarge). I acquired this book from the great granddaughter of the woman who wrote this book back in a small Nebraska town in the 30’s. She belonged to that generation of rural housewives who worked tirelessly to make ends meet and “keep body and soul together” for their families working the farms. [A]fter a conversation I had with a friend’s sister who used to live in North Eastern Colorado, given the type of recipes listed we decided it might be from a small town there, i.e., Sterling or Fort Morgan. Also North Platte or Scottsbluff, Nebraska. Even Cheyenne, Wyoming. If you Google a map of Sterling, Colorado and pull back, you will see all these little towns in that tri-state area. Blend well and press on bottom and sides of pie tin. Chill without baking. Sprinkle the gelatin over the 1/4 c. cold water; let stand. Scald milk. Mix beaten egg yolks, sugar, and salt; add milk gradually. Cook over water; stir constantly until it thickens, like thin custard. Add to gelatin and stir until dissolved. Cool until it begins to thicken. Add vanilla and fold in egg whites and whipped cream. Pour into shell and sprinkle with cookie crumbs. But add salt, no matter what this recipe says. Usually, 350 to 375 deg. F.